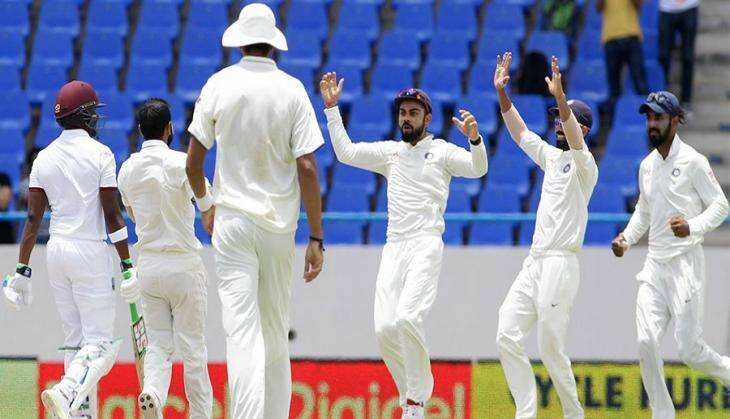 India stood on the brink of losing their number one status in the world as the fourth day's play in the fourth and penultimate cricket Test against West Indies was abandoned owing to wet outfield on 21 August. Efforts to get the Queen's Park Oval ready for play were given up in the very first hour of day four as the umpires called it off at 10.25 local time. The first inspection was scheduled at 10, and the umpires deemed the ground unfit for any cricket for a third day running. As per one member of the ground staff, the umpires had said that there was an improvement from day three, but not sufficiently enough to allow for the game to advance. And so, India are set to lose their no.1 Test ranking, which they had gained last week following Australia's 0-3 loss in Sri Lanka. To retain this ranking going into the long home season, the Indian team needed to win this final Test in Trinidad and take the four match series by a 3-0 margin. But that looks impossible at this juncture, with threat of more rain and the ground in poor state. Pakistan will thus become the new no.1 Test ranked side, courtesy their 2-2 draw in England. Earlier, an ICC release had said that the new no.1 side will be presented with the Test mace after the completion of this West Indies-India series brings out the new rankings' order, which should be around lunch time here on Monday once this match is finally abandoned. Only 22 overs were bowled on day one at the Oval, on Thursday, and after winning the toss, West Indies were placed at 62 for two at lunch when the rain showers first came. Kraigg Brathwaite (32) and Marlon Samuels (4) were unbeaten at the crease, with Ishant Sharma (1-7) and Ravichandran Ashwin (1-22) the wicket-takers. The former dismissed Leon Johnson (9), caught at short leg by Rohit Sharma, and the latter bowled Darren Bravo (10) with a beautiful off-break delivery. Bhuvneshwar Kumar (0-13) and Mohammed Shami (0-14) were the other bowlers deployed. Day two and three were abandoned without a ball being bowled, just like day four, as wet outfield and intermittent showers made sure that the ground was unfit for cricket. The facilities here have been questionable, since the ground staff didn't cover anything but the square on day one, thus letting the bowlers' run-ups be soaked. There is no Super Sopper available either, with blow driers put in use to soak up the surface moisture. Drainage has been poor since the ground had received ample rainfall in the week leading to the Test, owing to the monsoon season here. Even so, all these factors make for a poor excuse for an international Test venue to not have any cricket for three days without much rainfall and with the sun shining brightly for the last two days. From the point of view of the Indian team, looking to maintain their no.1 Test ranking, this fourth Test has been a near farcical exercise.